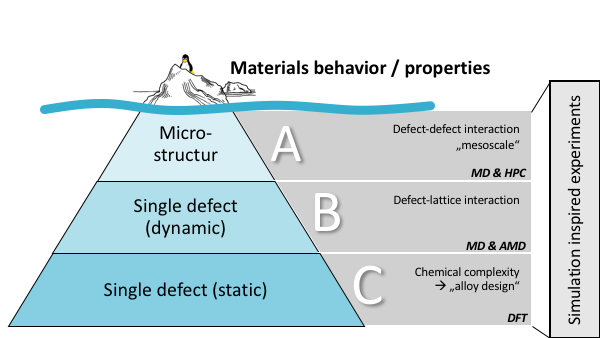 (B) For the dynamics of single defects the focus is on the thermodynamics and kinetics of defect nucleation and defect motion. This also include sophisticated models and simulations methods to explore the rare-event dynamics of thermally activated processes to reach with atomistic fidelity time scales, which approach experimentally relevant regimes. 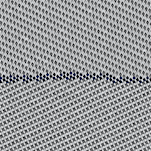 (C) With the focus on static properties of defects in chemical different environments with ab-initio (Density Functional Theory) simulations methods we predict alloying trends for the properties related defect dynamics. C. Ensslen, C. Brandl, G. Richter, R. Schwaiger, and O. Kraft, Acta Mater. 108, 317 (2016). C. Brandl, T. C. Germann, A. G. Perez-Bergquist, and E. K. Cerreta, Mater. Res. Lett. 1, 220 (2013). M. Velasco, H. Van Swygenhoven, and C. Brandl, Scr. Mater. 65, 151 (2011). G. Perez-Bergquist, E. K. Cerreta, C. P. Trujillo, G. T. Gray, C. Brandl, and T. C. Germann, Scr. Mater. 67, 412 (2012). E. K. Cerreta, J. P. Escobedo, A. Perez-Bergquist, D. D. Koller, C. P. Trujillo, G. T. Gray III, C. Brandl, and T. C. Germann, Scr. Mater. 66, 638 (2012). E. Bitzek, C. Brandl, P. Derlet, and H. Van Swygenhoven, Phys. Rev. Lett. 100, 235501 (2008). C. Brandl, P. M. Derlet, and H. Van Swygenhoven, Model. Simul. Mater. Sci. Eng. 19, 074005 (2011). C. Brandl, P. M. Derlet, and H. Van Swygenhoven, Philos. Mag. 89, 3465 (2009). C. Brandl, E. Bitzek, P. M. Derlet, and H. Van Swygenhoven, Appl. Phys. Lett. 91, 111914 (2007). 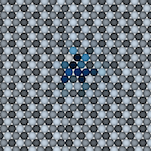 A. Kobler, C. Brandl, H. Hahn, and C. Kübel, Beilstein J. Nanotechnol. 7, 572 (2016).